Fans come first in the world of sports. 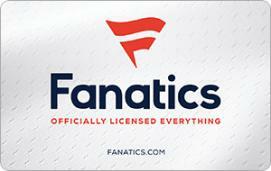 At Fanatics, we embody that in everything we do as we bring you the very best officially licensed sports apparel. As official partners of the NFL, MLB, NBA and NHL, our emphasis is always on a top-notch experience for fans everywhere. Soccer fans can score a goal on team pride with our new assortment of MLS and World Football apparel. And any Fanatics shopper can take advantage of our free Fanatics Rewards program, awarding FanCash back on all purchases to build credit for more gear. Our Satisfaction Guarantee is unmatched in the industry and ensures you get the most out of your shopping experience every time. Fanatics isn't just a leading sports apparel provider - we're fans just like you, and always put the fan first in everything we do.